Dear Friends and members. We hope you are coping with the unseasonable cold weather. 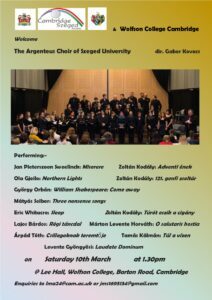 First, a visit of the Argenteus Choir of Szeged University, from 7 to 11 March, culminating with a free concert by this superb choir at Wolfson College, Barton Road, on 10 March at 1.30 pm. An exciting mixture of Hungarian and other music. All welcome. 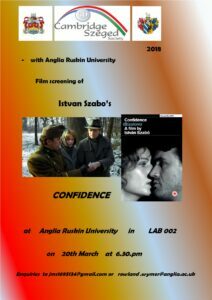 Second, a screening of Istvan Szabo’s film ‘Confidence’ at the Anglia Ruskin University, in LAB002, on 20 March at 6.30 pm. Please come and enjoy both these free events.